The recent change in the LinkedIn news feed algorithm made me realize that my network diversification had gotten out of whack. The categories (or asset classes) of people no longer supported my time frame and risk tolerance. It’s time to start rebalancing. Your LinkedIn network is an asset and the connections you build are investments. Like any other investable asset, you need proper diversification to achieve your goals – taking into consideration your time frame and risk tolerance, of course. First, it’s important to understand the different LinkedIn Connection Asset Classes. Close Friends/Family (Gold) – Your friends and family are gold. Their value never diminishes, and they always have your back. When you reach out for help, you know they’re going to respond. While they may not be a strategic fit to your business and career goals, they will always be your cheerleaders – and everyone needs cheerleaders. Clients (Real Estate) – Your clients are real estate. They usually hold their value as long as you maintain them and the more you invest in them, the more they appreciate in value. The more impressive they are, the more others like them want to be part of that circle. Target Market (Stocks) – These are the people who can help you most in your future career goals or who would buy the services/products your business offers. Target Market connections are stocks. Individually, some will be winners and others losers – not in terms of who they are as people, but in the help they’re able to provide to you. This asset class will perform well when there is a significant and growing quantity of connections in this grouping. If you aren’t connected to many people in this asset class, it’s going to be very hard to achieve your goals. Centers of Influence, Referral Partners, Connectors, and Collaborators (Bonds) – These connections are bonds. Their overall value stays pretty consistent, but they pay interest in terms of introductions, visibility, and opportunities. They help you reach your target market which hopefully converts to clients. Fans & Followers (Money Market) – These are people who invited you to connect because they value your expertise and the content you share. They aren’t a direct fit to your target market, but they are your brand advocates and can help you get visibility and introductions to your target market. Fans are money market funds. While there is risk in them losing their value, they almost never do. Additionally, they pay interest in helping spread your message far and wide. Current Work Colleagues (REITs) – Connecting to colleagues and supervisors where you currently work is like investing in REITs (Real Estate Investment Trusts). There are pros and cons that could lead to outstanding or disastrous results. They have tangible value because you’re actively working with them now, you’re all trying to advance the goals of the company you work for, and you can demonstrate your expertise and value to leaders in your company that you may not interact with on a daily basis. This activity could help you get a promotion. This is all well and good as long as you’re happy and you see your future continuing with the company. When you invest in a REIT, your money gets locked up for a significant period of time and if the value of the real estate plummets, there’s no getting your money out to stop the loss until the surrender period is over. If you connect with many people in your company and you decide you don’t want to work there anymore, it becomes very difficult to leverage the power of LinkedIn without making those co-workers aware that something’s up. It’s a double-edged sword and most people don’t recognize the downside to those connections until they get cut. Past Work/School Colleagues and General Acquaintances (Cash Savings) – These are your savings account. Their value remains steady because they know who you are and that you have some history and interaction with them. They could earn you a little interest in terms of job and business opportunities, but most of the time not. But you can always turn to them when things get tough and you need some help. Competitors (Loans/Promissory Notes) – Competitor connections are loans. While you can have synergistic and referral relationships with some competitors that pay interest, if they are not properly vetted and monitored, they could become toxic assets. They have access to see your marketing strategies and your other connections and can easily steal business opportunities and ideas. Competitor connections are a risk that requires diligent underwriting before investing. Default invitations to connect from people you don’t know that you accept without verifying (Naked Call Options) – Connecting with people who invite you to connect that you don’t know and don’t vet, is the same as selling Naked Call Options. A naked call option is when you sell someone the right to buy a stock from you that you don’t already own at a set price. If the price of the stock goes way higher than the price you agreed to sell the stock at, you have to go into the market and buy it at that much higher price than you’re required to sell it, potentially losing a lot of money. There are bad people on LinkedIn and tens of thousands of fake profiles. If you connect with those people, they have access to your email to not only spam you, but use your information to hack your LinkedIn account, other online accounts, company servers, etc. Or, the person could become a new client. The issue is that you cannot predict the outcome and if things go the wrong way, they can be devastating. But, there’s another important layer to your portfolio diversification. In addition to the mix of connection asset classes, there is also a filter that you need to lay over the entire portfolio. That filter is engagement. Since the news feed algorithm change, having your connections engage with the content you share is crucial to LinkedIn continuing to share it and give you the visibility you want. If a significant percentage of your LinkedIn network are not actively engaged on LinkedIn on a regular basis, then you will struggle to get visibility. For me, I’ve been actively growing my target market asset class – which is important to do if you want to use LinkedIn to get new clients. However, my target market is one of the least active and engaged industries on LinkedIn. So, even though I have thousands of connections, I’ve not been getting a ratio of views on many of my posts that I’m happy with. Don’t get me wrong, I’ve had some home runs, but also some disappointing results. So, I’m rebalancing by actively adding engaged LinkedIn members to my network. With Sales Navigator, I can find engaged target market people because there is a tab in the search results to show people who meet the search criteria AND have posted on LinkedIn within the last 30 days. That’s the gold mine and I’m leveraging my Sales Navigator subscription to connect with those people. Also, when I post something that gets a lot of engagement, I review all of the people who liked and commented and invite them to connect if we’re not already connected. They’ve already proven that they want to engage with my content and would be great to beef up my Fans & Followers asset class. Of course, if they look shady, I don’t invite them. There is some risk with this strategy, but it’s a risk worth taking at this point to increase the numbers of engaged connections in my network to increase my visibility and the investment I’m making in the content I’m creating. If you’ve not been happy with the results your LinkedIn activities have been generating, then you should really review the makeup and diversification of your network. If you’re not building your network with intention, then you’re gambling. If you like to gamble, then good for you. If you want to build something that you know will have value, then it takes strategy, analysis, and consistency. 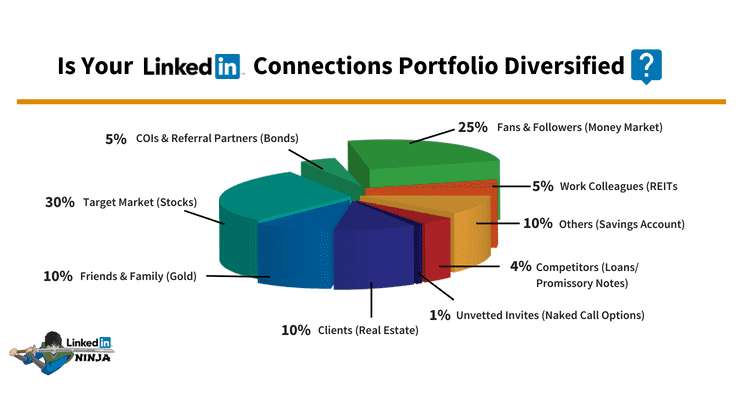 One of the most important asset classes to get visibility on LinkedIn is Fans & Followers. Treat LinkedIn as you would any other investment. Just as with investment management, you can spend hours learning on your own and trying to do it yourself, or you can invest in hiring a professional. The LinkedIn Ninja can create a plan and train you to it so that the time you’re investing in LinkedIn produces the best results, or we can actually do some of the work for you. If you’re interested in learning more, schedule a phone call at https://calendly.com/linkedinninja/30min.